Tales of landscapes and winds, of islands and people. On a sailing boat, from the Red Sea to the Indian Ocean. 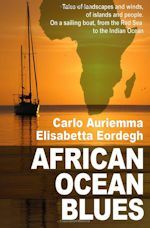 Carlo Auriemma and Elisabetta Eordegh live on the west coast of Italy and have been exploring the world by boat for 25 years. In fact, exploring by boat is their business. They produce documentaries of their watery travels for European television networks. In this book they head out along the Red Sea and into the Indian Ocean. The journey described in this book includes visiting the coasts of Yemen, Sudan, the island of Socotra and the Maldives...how exotic... (Well, their experience is not always exotic...there are occasional meals when all the food that is left is a bag of sweet potatoes.) The amount of professionalism with which they approach both problems and blessings is impressive...experience certainly grows grace under pressure". Because they seek out particularly remote locations and islands unfamiliar to most of us, maps and charts would have been a welcome addition. I found myself with an open iPad while I read the book just to follow along and keep oriented. Aside from the description and discussion of the journey itself, what I enjoyed most about this book is the fact that they are not "proper" sailors, but practical ones. They were taking shelter in an estuary because of talk of an oncoming cyclone. "All told we were quintuple parked, far from land, with a bridge of disaster- stricken ships between us and the dock. All the better. At least we were beyond the reach of curious citizens who were lingering docksides and who could easily have decided to visit our boat while we were ashore, had we been moored closer." Practical, unpretentious, and at the same time, exotic, are all words that describe this super book. It will take you far away from the February blues. First published in Italian in 2001, it was not translated into English until 2015...so don't use it as a guide book!